Here is my annual summary of the 2015 Project Limulus Survey Sessions. 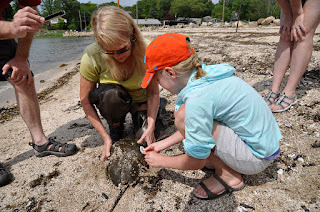 Our horseshoe crab surveys began on May 1st and ended on June 18th. The Project Limulus volunteers surveyed the two beaches at Indian Cove in Guilford a total of 14 times. The surveys are conducted around the time of the full moon and the new moon and always begin at high tide. The standardized surveys are always done in Indian Cove but tagging can be done at any of the Guilford beaches. My unscientific guess is that storms Irene and Sandy had something to do with the low average number of crabs found in 2013. With the exception of 2013 and 2014, the horseshoe crab population in Indian Cove seems to be fairly stable. Recaptures are crabs which have already been tagged. We record their tag numbers in our data. Our recapture totals have been declining over the past 4 years but we don’t know why. This year we only found 20. 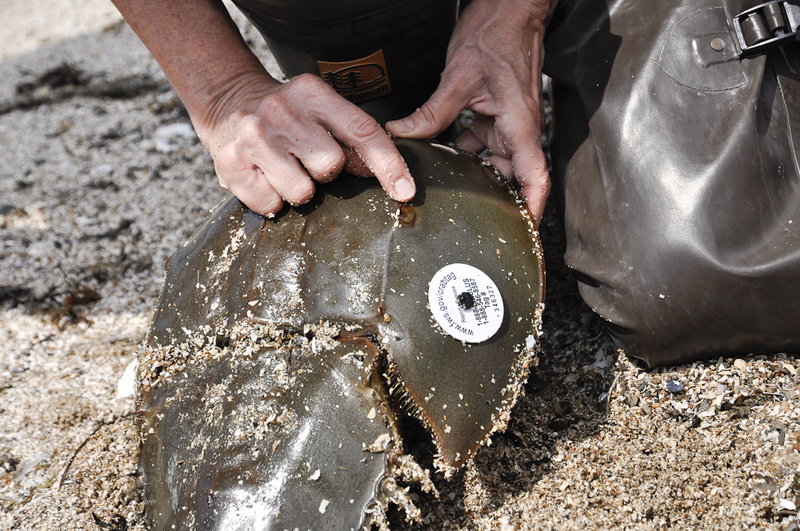 If you find a horseshoe crab and it has a tag, please record the I.D. number and call the phone number on the tag to report it. Please make note of the date and where you found it. Dead crabs with tags are important to report as well. I am sincerely grateful to all of the people who were able to help this year. I am fortunate to have such an awesome group of volunteers! 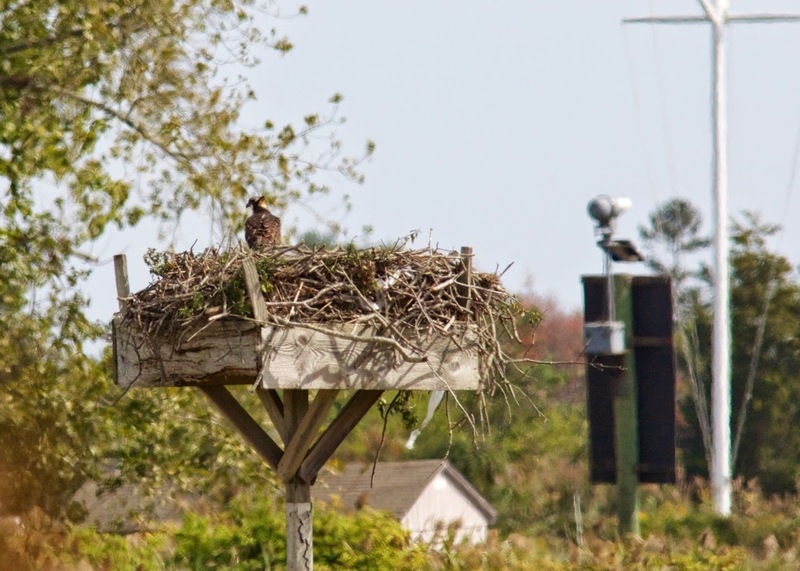 On October 13, Menunkatuck's Terry Shaw repaired this Osprey platform along the West River just south of the Jared Eliot Preserve in Guilford. Although all four supports looked good from 100 yards, three of them weren't attached at ground level and two of them were separated. From a distance the support looked OK. However, it was not attached to the support post. Four new support posts were driven into he marsh 4' deep with our custom driver (two minutes each!). The posts are 5' long with one foot above ground.The braces were through bolted to the original supports with 1/2" galvanized bolts. One of the side boards was removed and a new one installed. The sheet metal predator guard will be replaced later. Because the original nest was so large that it made the platform too top heavy, about 70% of the nesting material was removed. Next up is a platform across the West River just south of the Guilford Yacht Club. This one is in such bad repair that it will be replaced. If you can volunteer to help, please let us know. Email terry@menunkatuck.org. We also need financial support for these repairs. We have received a generous donation that will cover most of the replacement costs for what we call the GYC platform. There are many other platforms that will need fixing before the Ospreys return in March. Mail your check to Menunkatuck Audubon Society, PO Box 214, Guilford, CT 06437. You can find patches of the lovely native spotted jewelweed (Impatiens capensis) thriving in the dappled sunshine along the edges of streams, ponds, swampy spots, and other moist shady places during the summer and autumn months. This succulent annual reaches heights of two to five feet while spreading its tender stems of toothed, pale green leaves. Its jewellike flowers hang delicately from long, slender stalks from July to September, attracting hummingbirds and bees to a favored nectar source. 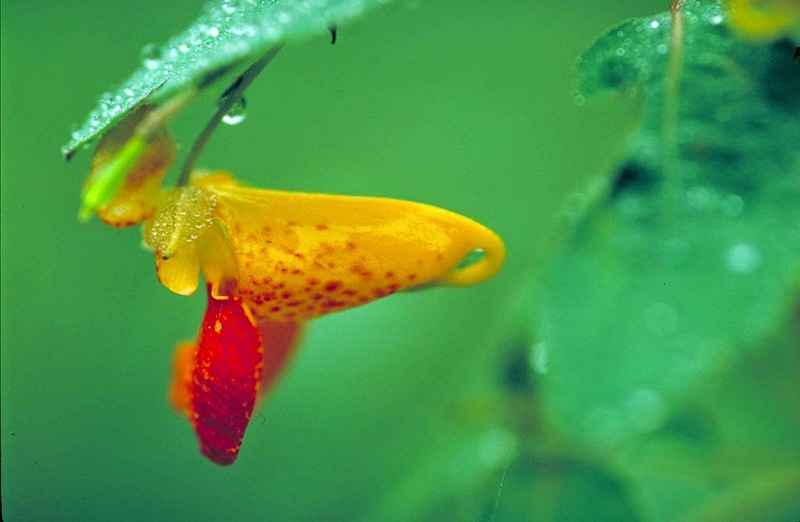 The jewelweed’s one-inch irregular flower is an orange tubular sac with a recurved spur drooping down from the back. Two fused petals form the wide lower lip of the flower, creating the perfect place for an insect to land while collecting the nectar from the blossom. Colorful red spots splash across the spotted jewelweed’s orange surface, giving the plant its common name. A long tongue is required to find the nectar deep within the jewelweed’s tubular flower. A hummingbird with its very long tongue has no problem. And bumblebees and honeybees also have tongues long enough to reach the nectar. But sometimes a bumblebee will cheat; it chews a hole in the back of the flower near the spur and sips the nectar from there. Touch the ripened, elongated seedpod of the jewelweed in the fall and the seeds are propelled at great velocity as the pod splits open - hence its nickname “touch-me-not.” (Let your planters of impatiens go to seed and you will find that they bear the same type of seedpods and will explode in the same fashion. Impatiens is Latin for impatient, a reference, no doubt, to these impatient seedpods.) Jewelweed seeds are eaten by upland gamebirds, such as ruffed grouse and bobwhite, and by white-footed mice. In the past, the jewelweed was also known as “silver leaf” – when its leaves are bathed in rain, droplets form, or when submerged in water, tiny air bubbles form on the surfaces, giving the plant a silvery appearance. But perhaps this plant is best known for its ability to neutralize the effects of poison ivy, stinging nettle, and bee stings. Break the hollow stem of a jewelweed and rub its juices onto the infected area to lessen the pain. This amazing and beneficial plant also contains a fungicide that is used to treat Athlete’s Foot. Every year from the end of August through early October, hundreds of thousands of swallows, mostly Tree Swallows, roost in the reeds of Goose Island in the Connecticut River. As the sun heads toward the western horizon swallows appear by the ones and twos from all directions. Soon 40, 50, 100 birds fly in from their daytime foraging areas – up to 50 miles away – and join a growing flight as they fly around above the river. More and more swallows gather to form a flock so large that the sky becomes dark with the swirling birds. As the swallows circle above the river, they form a denser flock over Goose Island. Then as the sun sets and light fades, at some unknown signal one or two swallows drop into the marsh and the others follow forming a tornado-like funnel that races across the island as the birds go to roost. In a minute or less all of the hundreds of thousands of birds have disappeared and the sky is clear. This spectacular event, only discovered in the late 20th century, was described by Roger Tory Peterson as one of the wonders of the bird world. 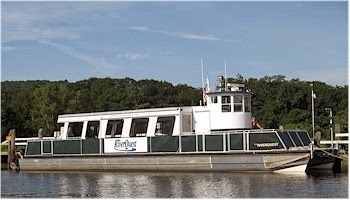 And Menunkatuck Audubon Society and Audubon Connecticut have chartered the RiverQuest for September 19 for a private cruise to watch this amazing extravaganza. Leaving at 5:00 p.m. from Eagle Landing in Haddam, the RiverQuest will cruise down the Connecticut River while we look for other birds and wildlife as we draw closer to the Goose Island. 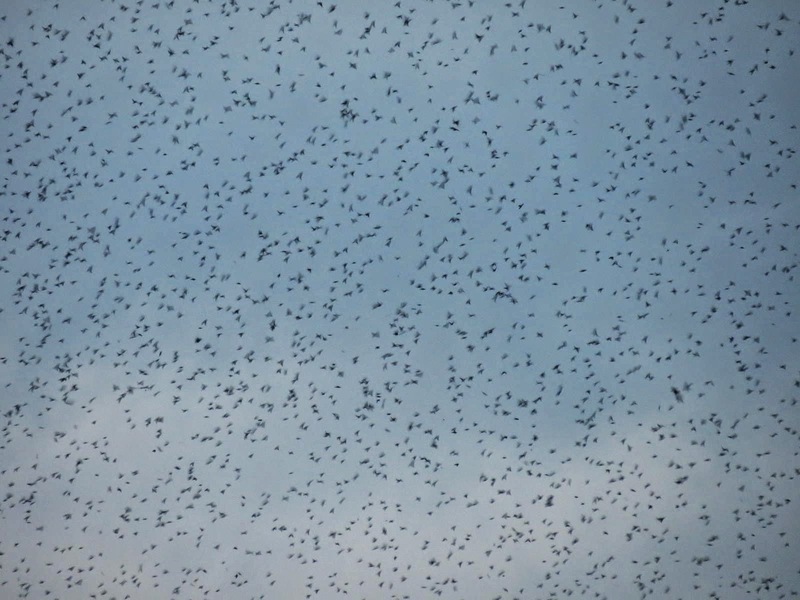 With commentary by Patrick Comins we will wait as the swallows fly in and marvel at their ability to gather in such huge numbers without crashing into one another. Then in an instant it is over. During the cruise light refreshments will be available. Cost for this trip is $40 per person. Space is limited! For questions or to reserve a place email Dennis Riordan at driordan@snet.net or call 203-387-2167. Upon confirmation of your reservation, please pay by check to Menunkatuck Audubon Society, Swallow Cruise, PO Box 214, Guilford, CT 06437. The RiverQuest’s berth is at the first parking lot on the left as you enter Eagle Landing State Park in Haddam. Take Route 9 to Exit 7 (Route 82 East). Follow Route 82 east through Tylerville Center. The park entrance is on your right just after the railroad tracks.. Remember! Space is limited! Book early. The family-oriented BentFest 2014 will feature picnicking in the meadow, river and nature walks, hay rides, tie-dye T-shirt creations, food vendors, kids’ activities, bird watching, raffle prizes, plus live music. The Bent of the River is an Important Bird Area with a diversity of habitat and worth the drive from the New Haven area. Lighthouse Point Park in New Haven is an Important Bird Area on the Atlantic flyway, a major route for butterflies, hawks, and many other bird species in their annual migration south for the winter months. Festival events include bird watching walks, hawk displays, butterfly observations, bluegrass music, activities for children, and the annual hawk count. Enjoy this exciting two-day nature festival at Audubon’s sanctuary in northern Greenwich - a celebration of the annual hawk migration passing overhead at Audubon Greenwich’s “Quaker Ridge Hawk Watch”. Enjoy live animal shows, nature-themed games, environmental exhibits, and visit and learn from a wide variety of eco-friendly vendors exhibiting on-site. Quaker Ridge is an Important Bird Area. 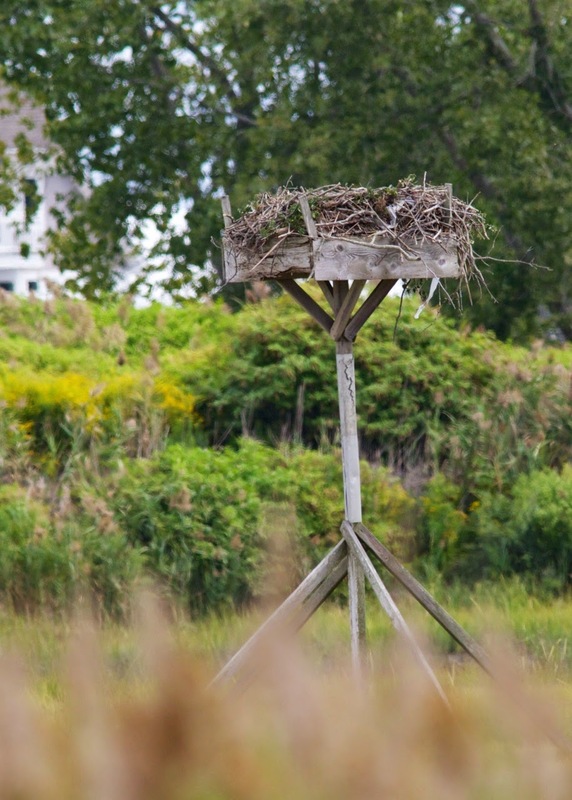 Celebrating New England’s Farming and Fishing History, there will be spinning, weaving, folk songs, New England crafters, bird watching walks at this Important Bird Area, and much more. The Kerry Boys will entertain the crowds with traditional songs on both Saturday and Sunday. Connecticut’s former State Troubadour, Tom Callinan, will share tradition and original songs and shanties. There’s sure to something for everyone to enjoy! 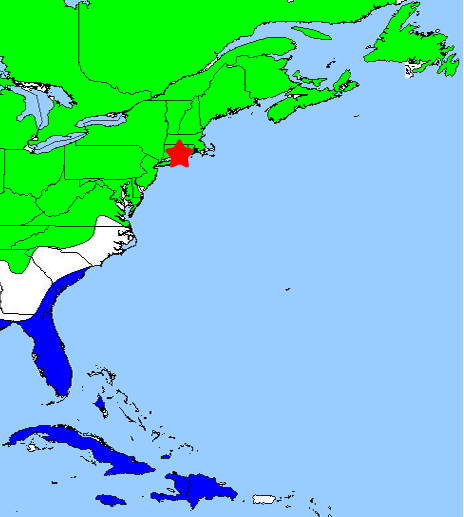 Eastern Tree Swallows follow the Atlantic Flyway to their wintering grounds in Florida, the Bahamas, and the Caribbean. From the Canadian Maritimes and northern New England the swallows will leave their breeding grounds and form loose flocks in the tens and twenties. These flocks join together to form ever larger groups. And in Connecticut they stop to rest and refuel before going on. Goose Island in the lower Connecticut River can have hundreds of thousands of swallows roosting at night. They spend several days flying as many as 50 miles away to northern and western Connecticut and to Long Island to feed on insects and berries, returning to Goose Island each evening to roost in the safety of the numbers. Each day some of the Tree Swallows will leave the group and be replaced by ones from farther north. As the Tree Swallows migrate farther south they continue to stop in reed beds every 100 miles or so, roosting together at night and foraging separately during the day.